The main goal of traditional dentistry is to keep your teeth healthy and free of disease and decay; cosmetic dentistry takes dental restorations to a whole new level, with a concentration on enhancing the overall look of your teeth. With cosmetic dentistry, even getting a cavity filled can be an opportunity to improve your smile. Cosmetic dentistry, sometimes called "esthetic dentistry," includes a variety of different procedures that not only focus on dental health, but that blend art and science together, in order to improve your appearance. 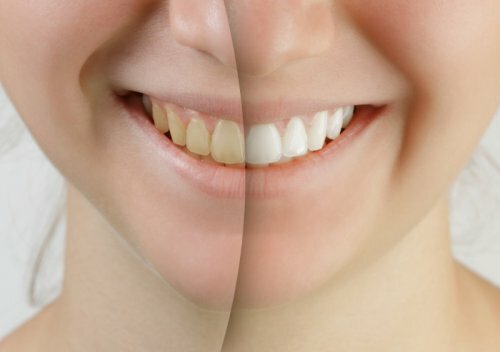 While teeth whitening often comes to mind when people think of cosmetic dentistry, this area of dentistry also includes various other techniques and dental treatments to improve the overall appearance of teeth. For teeth whitening, we offer the Zoom®, BriteSmile® and GLO™ techniques which whiten teeth in one hour. We also offer bonding, which places tooth-colored resin materials on the surface to repair, support, and protect your tooth. 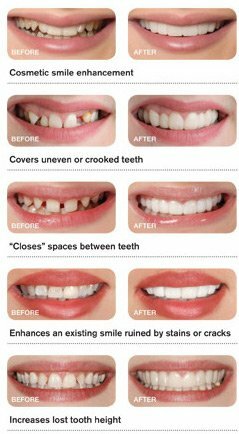 Veneers are made from porcelain or resin and are bonded to teeth, mainly for esthetic purposes. Implants and braces are also two standard devices used in cosmetic dentistry. Implants are used to fill in missing or broken teeth, and braces are used to straighten or realign teeth. Which teeth whitening technique to use depends on the specifics of your situation. Our cosmetic dentists not only understand the technology behind Cosmetic Dentistry, but also understand the details of your oral health and can help you with your unique cosmetic dentistry needs. An affordable, non-invasive dental appliance that snaps on over existing teeth to provide an instant perfect smile. Available for top and lower teeth. Made of high-tech dental resin, Snap-On Smile is thin and strong, making it comfortable and convenient. You can eat and drink with your Snap-On Smile and it's easy to care for. Snap-On Smile is an excellent choice for those with gaps, crooked, stained, or missing teeth. You pick the style and shade of your Snap-On Smile and we'll fit it based on an impression for a comfortable fit. Our commitment is to provide the highest quality of dental care for our patients, and we want to do the same for you. For more information on cosmetic dentistry or teeth whitening, or to schedule an appointment, please call 585-342-1323 or send us an email today.